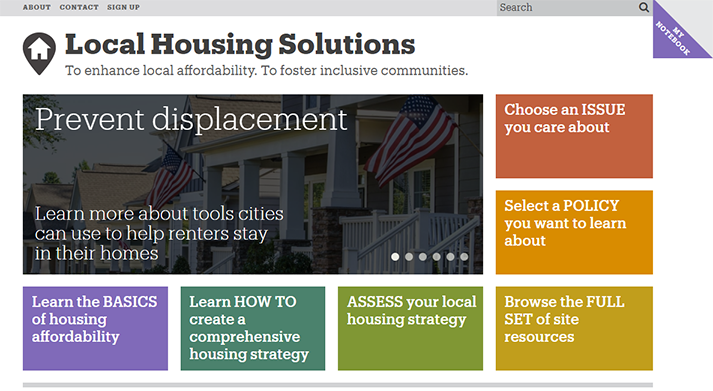 An interactive online tool launched last fall, LocalHousingSolutions.org helps cities, counties, and towns develop comprehensive and balanced housing plans that enhance affordability, protect low-income residents from displacement, and foster inclusive neighborhoods. The non-partisan site provides step-by-step guidance that local officials, stakeholders and residents can use to analyze local housing needs, identify housing policy objectives, and select and implement policies to achieve those objectives, while balancing competing needs and interests. The new tool, which includes information on more than 80 separate housing-related policies, was developed by the National Community of Practice on Local Housing Policy, a joint initiative of the NYU Furman Center and Abt Associates with funding from the Ford Foundation and the John D. and Catherine T. MacArthur Foundation.